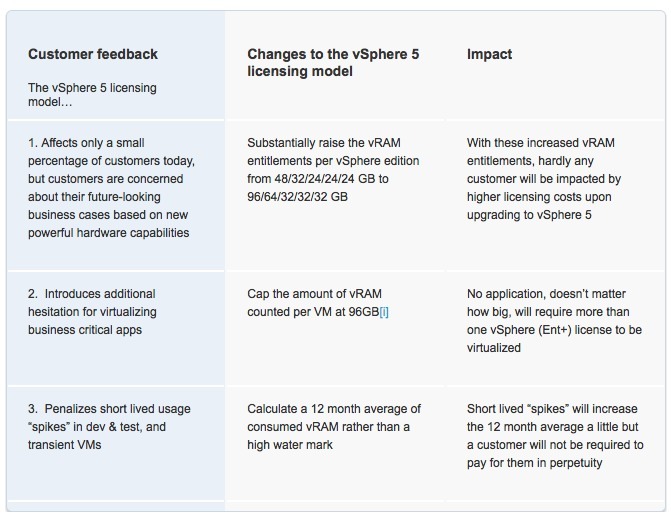 It has been a few weeks since VMware announced their new vSphere 5 licensing model and for the most part I haven’t said much nor expressed a strong stance on the issue. For you who are not familiar, VMware essentially provided a vTax associated with configuring licensing for pooled ram allocation. It is a bit more complicated, but you get the picture. Just know it basically doubled the cost for most large customers, particularly hosting companies and super dense virtual environments. To say the least it wasn’t well received by the partner community, server OEM’s, customer etc. This changed caused some very uncomfortable conversations with my customers. From their perspective I am the one that sold them this solution, recommended it over hyper-V and unfortunately good or bad I am the face of this product. And it wasn’t just tough talk; customers were essentially asking for refunds and questioning my credibility. While it wasn’t fair, I didn’t fault them for their frustration. This isn’t specifically a VMware issue, and I don’t mean to pick on them too much, it could happen with any vendor. Cisco could easily change their pricing model to a per port model, or amount of traffic per port, or some other consumption model. The point is, if there is a disruptive change to the basic pricing model of these joint technology solutions it sort of tips the whole thing off its axis. People make their budgets, TCO, ROI or other business decisions based on a predictable pricing structure and this doesn’t help their cause. It puts people on edge when they make these significant technology investments. Now the great news is that VMware listened intently to their community and made some significant changes. Say what you will but this is a big deal. They didn’t have to, if they held their ground things would have blown over and whatever lost revenue would have made up over time. It was also changed with blazing speed. I don’t know what happened behind the scenes, but to come up with a new pricing model in a week or two that everyone agreed on is pretty impressive. Officially, I don’t have one, however I am bit concerned how much impact a simple pricing change can have on my professional career. Also, I am hoping that Cisco, HP, Microsoft, EMC, NetApp, VMware and anyone involved with this ecosystem are working closely together on their pricing strategy. I would be curious what Cisco had to say about their UCS servers and the new ram allocations. This considering their whole architecture was built around a condensed server with huge amounts of RAM vs. CPU’s. I am sure they weren’t too pleased. Overall, I think VMware learned something’s about pricing changes and product launches, and in the end made things right.